I couldn’t sleep yesterday so at 4 am I got out of bed and started working on a plan for the next couple of months. I realized that I have no idea where the time has gone this year! I have less than 13 weeks of my 6 month Mexican Visa and there is less than 2 weeks until 2019!!!!! As I have mentioned in previous Outsidevibes Weekly Updates, I have been struggling with the direction of Outsidevibes and myself these past couple of months, so I spent all day yesterday creating a spreadsheet in order to have a set plan and a streamlined focus for the start of the new year. I want to do everything and I want to do it all right now. I want to design products. I want to build Outsidevibes into an awesome brand. I want to grow Outsidevibes social media presence. I want to continue blogging about travel and my adventures. I want to inspire people to travel. I want to run guided tours. I want to provide beginner travel guides, online-classes or set up speaking engagements. I want to become a travel agent. I want to start a travel podcast. I want to work on travel photography. I want to edit and work on my past photos and videos to create awesome visual content. I want to find remote work. When traveling or creating any business time and money go hand-in-hand and I don’t seem to have enough of either of these, to accomplish all of my ambitions. I have so many goals I just don’t have the time vs finances to accomplish them all. By dividing my attention these past few months I have too many half-started projects which in-turn has taken precious time out of each day, leaving a feeling that I haven’t accomplished anything. That leads me to thinking that I’m not working hard enough when in actuality I am overworking most days. Obsessing over multiple goals simultaneously has caused extra stress and lost finances that could be used for other things. The hard part about solely focusing on and working in the blogging world is that most people spend years grinding only to get nowhere and eventually give up. Even with constant attention and vigilant work the odds of success are so slim. If you do attain some form of a following or get your name out there the ability to then make money off of blogging is still not a guaranteed thing. The hard part about staring a brand right now, besides creating a full-fledged business and needing finances, is that I’m not around to get samples and test products, talk with vendors or to socialize in the community. Since I am away from home the seemingly more likely way of making my business work is getting into drop-shipping, which relies on third-party businesses to provide and ship products, which has its own downfalls. I have hesitated looking into drop-shipping in the past but with my current situation being away it’s something I may consider. The hardest part about spending all day online working on Outsidevibes, often learning new skills or trying to find ways to earn money online, is that when I do have the down-time to do personal work, like editing photos and videos, its hard to be creative having to be on the computer. I guess what I am rambling on about is that creating any business is difficult but starting one that is so dependent on the frivolity of the online world adds a whole other dynamic to success and failure. And on top of that, by pursuing my love of travel I am out of the country while simultaneously trying to launch a brand, making things even more difficult. 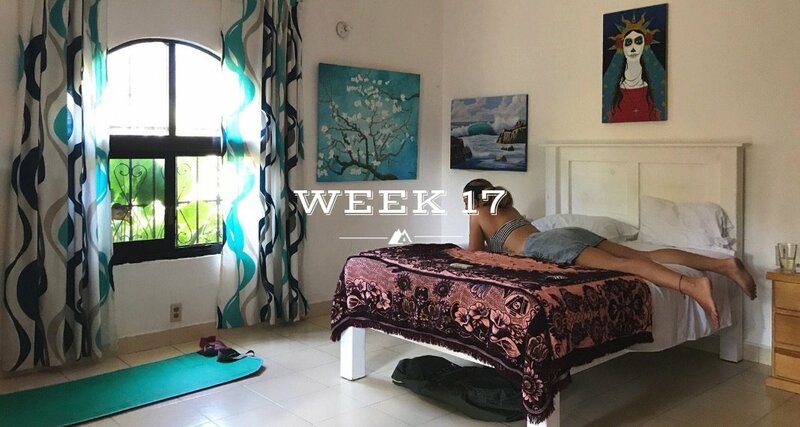 I began this weeks Outsidevibes Weekly Update with the intention to only share that we’d moved apartments down to the beach and it feels fantastic, but it has yet again turned into a ramble. Though the tone of this post has been negative, I’m all about sharing what’s going on in my life. So far we have made sure to be on the beach for every sunset and it’s nice to wake up to the sound of the ocean again. This is our last pre-booked apartment, we found this one a couple months ago through Facebook, to cover us through the holidays, which is a crazy busy time in Puerto Escondido. I think next month will bring some new travels, Emma’s grandma is coming to visit and afterward a few of her friends are flying down to meet her on the other side of Mexico. I am not sure what my plans are as of yet, probably going overland through Oaxaca to the Yucatan. Next week I vow no rambling. It’s been good to type out some of my frustrations I just don’t want them to come off the wrong way. Plus this has now taken way too many hours to write into some semblance of a coherent thought, causing lost time for other work 🤣. It did cross my mind to delete this post and re-do it without the rambling, but then that doesn’t quite feel right either. Anyway Happy Holidays, I hope everyone has a fantastic Christmas! Catch ya’ll next Wednesday.